Artwork from Museum of Church History and Art competitions reflects the importance of temple and family history work in the lives of Latter-day Saints. 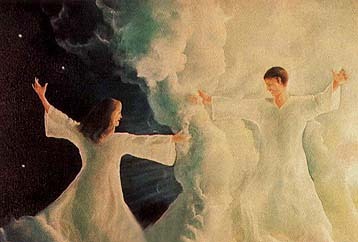 “The great Jehovah … knows the situation of both the living and the dead, and has made ample provision for their redemption,” wrote the Prophet Joseph Smith (History of the Church, 4:597). Modern-day leaders have continued to remind us of this important concept. Elder Boyd K. Packer of the Quorum of the Twelve Apostles said in April 1987 general conference: “Ordinances and covenants become our credentials for admission into His presence. To worthily receive them is the quest of a lifetime; to keep them thereafter is the challenge of mortality. “Once we have received them for ourselves and for our families, we are obligated to provide these ordinances vicariously for our kindred dead, indeed for the whole human family” (“Covenants,” Ensign, May 1987, 24). Baptism and confirmation represent the gate by which we embark on the straight and narrow path that leads to eternal life (see 2 Ne. 31:17–18). As we grow in our application of gospel teachings, we ready ourselves to receive the sacred ordinances of the temple﻿—the endowment and the sealing ordinances. 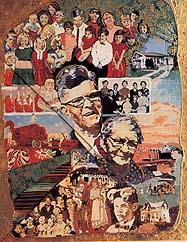 The following artwork by Latter-day Saint artists depicts various aspects of family history and temple work. Jean Dixon of Canyon, Texas, pays tribute to her grandparents in Grandpa and Grandma Warnock on 100-Year Anniversary of Birth: Bridges from Birth to Branches, mixed media, 1992, Third Art Competition. Marie Lynne Steele of Los Angeles, California, captures the feeling of family members reunited after death in Joyous Reunion, oil, 1987, First Art Competition. 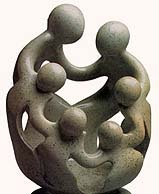 Agrippa Ndongwe of Mutare, Zimbabwe, portrays eternal family unity in Happy Family of Six Sealed for Time and All Eternity, handcarved from opalstone, 1993, Third Art Competition﻿—Award of Merit and Purchase Award. 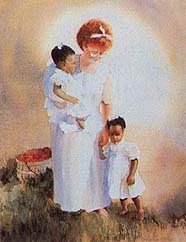 Rose Ann Peterson of Bountiful, Utah, depicts two girls about to be sealed to their parents in Sealing Dresses, watercolor, 1993, Third Art Competition. 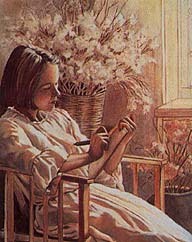 Carol Robinson of Raymond, Alberta, Canada, captures the peace of journal writing in My Golden Plates Are Paper, oil, 1993, Third Art Competition. José de Arnje Faria of Pac d’Archos, Portugal, created an artistic representation of his pedigree in Family Stories, mixed media, 1993, Third Art Competition. 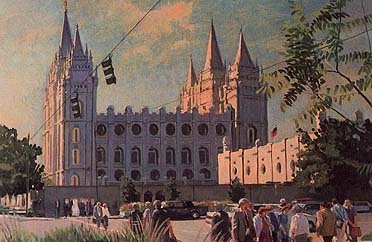 Winfred Ralph Geisler of Bountiful, Utah, painted the endless stream of patrons to the Salt Lake Temple in But Not of the World, oil, 1993, Third Art Competition. 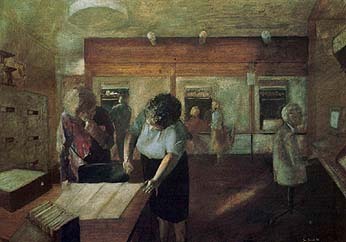 Ian T. Brand of Aberdeen, Scotland, shows a busy family history center in Redeeming Our Dead, oil, 1993, Third Art Competition.